I am always flicking through cookbooks and reading recipes but this time I had a purpose. My sister Sandra’s friend, Merle, had given me some cookbooks to look through and either keep or send to the Op Shop. This book had been earmarked for the Op Shop but two recipes in it appealed. One was ‘brown sugar biscuits’ and the other was this spiced tea bread (nut loaf). Maus likes a bit of cake with her butter so I was keen to try the nut loaf. 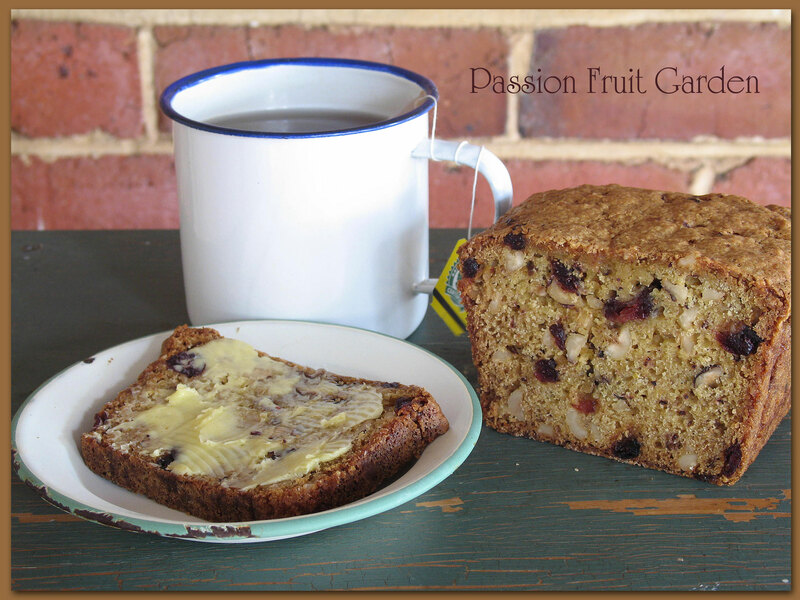 Tea bread or nut loaves are traditionally made with dates and walnuts in Australia so this cranberry and hazelnut version was a nice change. We both loved it – as you can tell from the photo – this is all that was left after a very short time. I had to quickly shoot or there wouldn’t have been anything to photograph. The ginger and nutmeg really shine through and the crust is nice and crunchy. Yummy! Best of all, I didn’t over cook it (which is my usual). It was lovely and moist. And it is dead easy to make – just add the wet ingredients to the dry ingredients and mix with a wooden spoon. Easy peasy. This recipe was found in a 1994 cookbook, The Complete Cook, which was compiled by Judith Ferguson. It is now on its way to the Op Shop. I have photocopied the biscuit recipe. Thanks, Merle. Line a loaf pan (about 22cm x 12.5 cm) with baking paper or grease it well. Preheat your oven to 170°C. As this is an old cookbook, I presumed the oven was not fan-forced. My oven is fan-forced so I decided to go with 160°C. Sift first 6 ingredients together into a large mixing bowl. Add the sugar, cranberries and hazelnuts and mix well. In a separate bowl, whisk together the orange juice, melted butter, water and egg. Slowly pour the wet ingredients into the dry ingredients and, with a wooden spoon, mix until combined. If you are interested in nut loaves, here are a couple I have featured before. Date and nut loaf mark I and mark II. This entry was posted in Cakes, Sweet Things and tagged Cranberry and hazelnut nut loaf, Nut loaf recipes by Glenda. Bookmark the permalink. Hi Moya, She is as skinny as a bean stick. I don’t know how she does it. if I’d been there, you definitely would not have been able to get a shot of that. I love hazelnuts and I really like the idea of cranberries in there too. This looks like something that could be made ahead for the holidays & then frozen…hmm, now I’m thinking mini loaves for gifts. (Diane’s nodding to herself right now). Hi Diane, I hope you decided to make it as it would be perfect for unexpected guests over your holiday period. Glenda, matter of fact I did & everyone really enjoyed it. I warmed it up a little this morning for breakfast. Definitely worth repeating. Hi Diane, Glad to hear it. I really like it too, I will be making it again. Yum. Like Maus I ikes a bit of cake with my butter 🙂 And ’tis the season for cranberries and hazelnuts… Christmassy I think. I might add this to repertoire… and maybe a variation. I love hazelnut stuffing, or sage, or fig… in my Christmas roast chicken but the G.O. prefers plain. Sigh. But, this year inspired by ChgoJohn, I’m baking Christmas biscuits with macadamia’s and dried cherries… but I’m still waiting for the dried cherries to come in stock at Kombu in Bellingen having looked in locally Sydney to no avail. I may have to make cranberry and hazelnut biscuits and loaf. Hi Ella. Good to hear you are thinking ahead. I never do. I always leave everything to the last minute. Love the combination of the cranberries and the hazelnuts, Glenda… I just ordered another kg from the grower in Orange, NSW (nuts, that is). I just love your recipes Glenda, making your chocolate Christmas cake soon, great ingredients!! Do you have a Fb site? No Lyn – I have resisted.